The Llama Sanctuary does not have the authority to seize neglected animals. That is the task of the RCMP and the SPCA. The Sanctuary may be called in to help, but has absolutely no right to enter upon the property of another or seize an animal. If you encounter a situation where there is obvious neglect, then call your local SPCA officer. Under common law however, the right thing to do is to go to your ‘brother’ and bring your perception of the situation to their attention. There may be a perfectly reasonable explanation for the situation that has nothing to do with neglect or abuse. For example, The Llama Sanctuary is often home to one or more extremely thin llamas or alpacas. You can be certain that the elderly and the sick are receiving special food and extra attention, but at first sight, a casual visitor might believe that these animals do not have enough to eat. Never leap to conclusions; unwarranted intervention can have distressing or even serious consequences. An alpaca with an abscess on the jaw does not mean that it has been neglected or is not receiving treatment. A llama that has a truly scruffy, matted and rotten coat will definitely need some attention, but shearing too late in the season, when insufficient time remains to grow a new coat before cold weather sets in, is terribly cruel, in our opinion. Once again an observer might believe that the alpaca is suffering from neglect, but it usually the most humane treatment to leave the fiber in place until the beginning of the warm season. And once again, that it is simply an opinion. 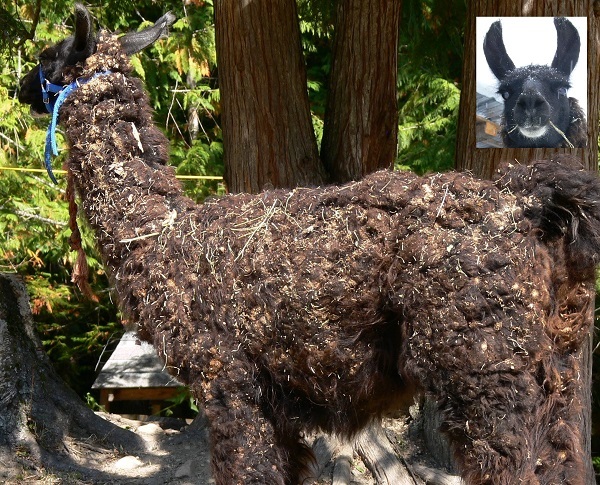 Upon investigating a reported case of neglect, the SPCA may occasionally request assistance from The Llama Sanctuary to catch, transport or provide a home for llamas in need. Blackberry was completely encrusted with burdock burrs when she arrived. They had been worked in tightly against the skin, causing irritation. In our opinion, the best way to deal with them was to let them soften and grow out with the coat and then shear the following spring. Burdock encrustation is known to kill animals in the wild, due to the impaired function of the protective fiber. If you know of a sanctuary that should be on this list, please let us know.